Imran Khan wins ‘big’ in Pakistan, but can he implement his ‘big’ ideas on foreign policy? Imran Khan, the leader of Pakistan Tehreek-e-Insaaf (PTI), has declared victory in Pakistan’s recent general elections, toppling the outgoing Pakistan Muslim League-Nawaz (PML-N) government in its electoral stronghold in Punjab. 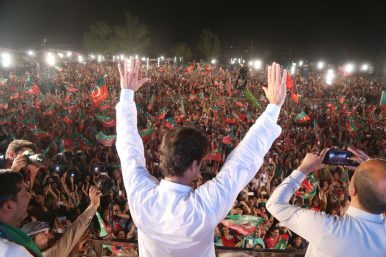 Pakistan’s political landscape, which became disputed after the Election Commission of Pakistan (ECP) failed to declare official results in the early hours after the closure of polls on July 25, appears to be accepting Khan’s victory. For now, the opposition is not expected to create a serious challenge in terms of opposing Khan’s electoral mandate. The divisions within PML-N ranks have widened further after the election and with no public appeal for protests and an absence of leadership, the party is likely to come to terms with the results. The other large political party, the Pakistan People’s Party (PPP), which was able to secure its traditional stronghold in Sindh, is not expected to push ahead in terms of any efforts to seriously dispute election results. Bilawal Bhutto, the young leader of the PPP who led the party’s election campaign, was able to draw large crowds, which should be a lesson for the party’s leadership when it comes to preparing for the next general election and in setting the organization’s future political priorities. Other smaller and regional political and religious parties, which took part in the election, have virtually been wiped out from the country’s electoral landscape. Khan’s first victory speech was filled with promises to promote transparency in governance, religious inclusiveness, and reforms in the country’s foreign policy. However, when it comes to his efforts on the ground to achieve his governance goals, he faces major challenges. To begin, Khan has been described and understood as someone who is impatient, unpredictable, and erratic. He is a strongman who doesn’t appear to be thoughtful, or willing to sit down and work his way through issues. Khan’s last five years in governance in the province of Khyber Pakhtunkhwa (KP) were big on promises and short on deliverables. Pakistan, on the other hand, faces entrenched economic and institutional challenges and Khan’s promise to introduce deep structural reforms in the country is likely to run into trouble soon. On the issue of foreign policy, Khan’s initial intentions were remarkably interesting and have raised a number of questions about his relationship with the country’s strong military when it comes to implementing those ideas. On the issue of Pakistan’s relationship with Afghanistan, Khan’s position was not any different than what he has followed thought-out his political career, which is to have a strong Afghanistan that he believes is in Pakistan’s interest. Moreover, he also mentioned that he envisions a future Pakistan-Afghanistan relationship where both countries can have open borders and free trade. It’s an interesting position to take given that Pakistan’s relationship with Afghanistan has remained strained and beyond some sub-state level contacts, Islamabad doesn’t have much of political constituency in Afghanistan. The military wouldn’t be averse to such talks as long as Khan doesn’t begin implementing his own ideas that might undercut Pakistan’s security preferences and role. With China, Khan’s position was fairly predictable: He mentioned China’s economic success story as the one that should be a lesson for Pakistan. “We will strengthen our relations with China, they have given us a chance by investing in the CPEC, and we also want to learn how to improve people’s lives, drag them out of poverty. Will also learn how to deal with corruption,” said Khan. The most interesting aspect of his remarks on Pakistan’s foreign policy concerned Islamabad’s relationship with New Delhi. Khan extended a hand of friendship to India and called for improved trade ties and peace talks. Moreover, he further said that both Pakistan and India need to end the blame game over Kashmir and Baluchistan, which he said has kept us in a long cycle of confrontation. “I assure if India takes one step forward, we will take two steps forward,” said Khan. There are two interesting aspects of his remarks relating to Pakistan’s relationship with India. First, during the election campaign, he vilified India and its policies in Kashmir. In his post-election victory speech, while he did mention Kashmir as an issue between India and Pakistan, he did not talk about an aggressive approach which remained a case throughout his election campaign. In fact, one can argue that Khan has a genuine desire to improve relations with India, but can he achieve even a fraction of that remains a question. It’s still unsure if he can draw a fine line between his desire to improve trade ties with India and also keeping the confrontation mode alive, which would sit well with the country’s powerful military. It’s an open question when it comes to how much space Khan will have to actually pursue his policy of reconciliation with India. Will the military, which is very sensitive on the issue of civilian government’s rapprochement with India, let Khan act? Second, it is important to mention that while Khan, over the course of last few years, decimated the outgoing government for its approach to have better relations with India, Khan’s post-election positions is interestingly similar to Nawaz Sharif’s position after winning the last general election in 2013. However, Sharif’s attempts to open talks with India without the military’s approval became one of the reasons for his ultimate isolation. One can argue that if Khan is to follow the same policy that Sharif followed with India, it is only a matter of time before he runs into trouble with Pakistan’s national security establishment. Beyond the flowery rhetoric and engrossing victory, tough days are ahead for Khan’s party. Ex-Pakistani PM Zeroes in on Pakistan's Civil-Military Divide in InterviewIt's Time for Imran Khan to Patch Things Up With the United StatesPakistani Military to Deploy Some 370,000 Troops During July 2018 ElectionsBy-Election in Punjab Reveals an Uphill Struggle for Pakistan Tehreek-e-InsaafShould Pakistan PM Imran Khan Expect a Major Opposition Party Challenge Soon?